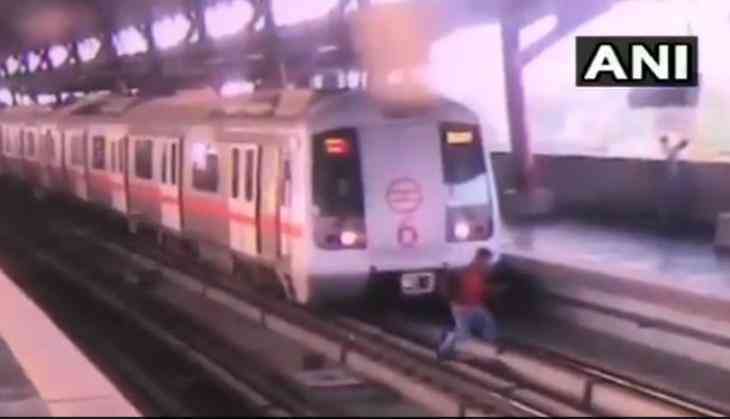 A 21-year-old man had a miraculous escape when he tried to cross the Delhi Metro track of Shashtri Nagar last evening. The man was later identified as Mayur Patel was trying to cross the metro rail track from one corner to the opposite one at the moment train started moving. The alertness of the driver, who spotted him and avoided the tragedy. The incident was caught on CCTV camera and the footage caught the nail-biting moment. Delhi Metro authorities later questioned Mayur about his dangerous and bizarre act. During questioning Mayur claimed he did not know how to cross over to the other platform, so he jumped on to the track and hopped across. As per news agency ANI reports, Mayur Patel chose to cross from one platform to the other via the tracks instead of the overbridge. Later he was fined by the authorities. Delhi Metro states that the penalty for the offence and crossing track without lawful authority is imprisonment up to six months or a fine up to Rs 500, or both. The Delhi Metro Rail Corporation (DMRC) said between the opening of a corridor of the Magenta Line in December and a section of the Pink Line in March, the number of passengers travelling has seen an upward trend.